In the past calendar year, the German Aerospace Industry generally was able to hold its own. The industry as a whole grew by 4.1%, reaching total sales of Euro 25.7 billion (previous year: Euro 24.7 billion). In 2011, the number of workers employed in the industry grew by 2.1% and now totals about 97,400 (previous year: 95,400). With app. 16.8% of total industry sales, investments in research and development in 2011 were at a similar level as in previous years. Last year the share of exports - based on overall sales of the industry - was app. 63.5% and therefore remained relatively stable compared to 2010. Despite the good results overall, the various industry segments have to be assessed individually. Civil aviation again managed to grow due to an increase in orders and deliveries. The positive market development in the civil aviation sector was of particular benefit to engine manufacturers and the equipment and materials industry. The space industry, too, showed increases in sales and employment in 2011. However, the military aerospace industry wound up in the red last year for the first time in years. Especially the military equipment and materials industry showed double-digit losses, among them many small and medium-sized businesses. On the occasion of presenting the current industry figures, BDLI President Dr. Thomas Enders said: "The German aerospace industry was a strong engine for innovation and jobs in 2011 too, which again allowed us to create about 2,000 high quality jobs in 2011 in Germany. We start off 2012 with good prospects in the civil aviation and space industry. The prospects for the equipment industry and materials manufacturers in these segments are also good. However, the future of the military aviation industry in Germany is at risk". "Germany can't afford this loss of technological competence and this threat to our servicing capabilities for aerial weapons systems. We need a military aviation strategy now, one that keeps an eye on the needs of the customer as well as on policy aspects regarding security, defence, technology and industry", Arndt Schoenemann, BDLI Vice President for Equipment and Materials, emphasized at the press conference. The civil aviation sector was able to develop very well in the last calendar year in the wake of world-wide fleet renewals and a strongly growing demand for mobility throughout the world. Compared to the previous year, the sector managed to increase its sales by 6.2% to a total of Euro 17.2 billion (previous year: Euro 16.1 billion). With app. 66.7% of total industry sales in 2011, the civil aviation sector still accounts for the largest sales volume in the national aerospace industry. Full order books and a hike in production rates in almost all Airbus and Boeing Programmes not only contributed to growing sales figures in 2011, but also to the creation of new jobs - especially in the civil materials, engine and equipment industries. With app. 67,500 employees, this segment showed an increase in personnel of 8.6% compared to the previous year (62,200). In light of the order situation and global market forecasts which, at an average annual growth rate of 5%, outline a doubling of global demand for aircraft by 2030, the large manufacturers of commercial aircraft have long-term prospects to be operating at full capacity, something from which German suppliers who won bids to take part in programmes such as the A380, A350 and A320NEO will also benefit. After a slump the previous year, the commercial helicopter manufacturing sector recovered markedly and sooner than expected, especially due to a considerable growth in demand in the Oil & Gas as well as Corporate segments in the US and Asia. "The general outlook for the civil aviation industry is good. But there are operational challenges we have to meet. First and foremost securing the supply chain, which is of central importance, since ramping up production in the systems industry by up to 40% over the next five years will entail considerable industrial and personnel requirements. At the same time the supply industry has to take up a strategic position in international competition and part of it has to reposition itself", so Schoenemann. Today, an increasing number of German suppliers were operating on a second and third-tier level, but not all efforts at repositioning oneself in the supply chain had been completed, Schoenemann adds. At the annual BDLI press conference he referred to a study on the situation of the German supply industry conducted by the BDLI in 2011. Another central area requiring action on the part of the BDLI and its member businesses will be securing sufficient long-term funding for aviation research - also within the framework of a civil aviation strategy still to be adopted by the Federal Ministry of Economics and Technology. The BDLI will also continue to push for the development of young talent in various age groups - for example within the scope of its school project "juri" - and for the recruitment of skilled workers within the scope of the ILA CareerCenter 2012. As an innovative high-tech sector and driving force for economic growth, the space industry was heading for success in 2011, as it did the previous year. This industry segment was able to increase its sales by 3.7% to app. Euro 2.2 billion (previous year: Euro 2.1 billion) and thus accounts for 8.4% of total industry sales. The growth in employment of 12.2% was above average. Overall, a total of about 7,500 people were working in the space industry in 2011 (previous year: 6,700). Central industry programmes such as the ATV or Ariane 5 and other satellite programmes went according to plan, Galileo was launched successfully. The industrial capacity of systems manufacturers and space industry suppliers in Germany was very well used in 2011. The German space strategy initiated by the BDLI and the sound budget situation in the space industry represented an important basis for accelerating the implementation of programmes of the German space strategy. The long-term goal is to further expand Germany's leading role in the European space industry. In the past years the federal government's high-tech strategy has laid the essential foundations for achieving this goal. The 19 ESA member states will decide on the future of the European space industry at the ESA Ministerial Conference in the fall of this year. What is important from the German point of view are the continued development of the successful European launch vehicle Ariane 5, the successful use of the international space station, a European, initially robot-based mission to the moon under German leadership, the development and construction of new European weather satellites also under German leadership as well as the further development of state-of-the-art satellite-based telecommunication technologies. Enders said: "After all, the European flagship programmes Galileo and GMES must be brought to a successful conclusion together with the EU. Independent European access to space with the Ariane 5 remains an important task for European politics." The situation in the military aerospace industry took a very critical turn and finished the year for the first time in years with a 1.1% decline in sales, falling to a volume of Euro 6.4 billion (previous year: Euro 6.5 billion). Thus 24.9% of industry sales accounted by this sector. Great uncertainty - especially among suppliers of this industry segment - led to slight job losses in 2011. About 22,400 workers were employed in this industry segment in 2011, which is 1% under the employment level of the previous year (previous year: 22,600). Especially the long-term outlook for this industry segment looks critical. The first effects of the Bundeswehr reform directly impacted the military aviation industry in 2011. Considerable strains of the industry to the delivery of the German version of the NH90 transport helicopter, the handover of what in the meantime is the 300th Eurofighter, the start of serial production of the A400M transport aircraft or the introduction of the unmanned Eurohawk aerial vehicle cannot hide the precarious situation in this industry segment. Schoenemann explained at the press conference: "The Bundeswehr reform already has mainly small and medium-sized businesses at the very front of the supply chain fear for their survival today. Our survey indicates that some businesses will withdraw from the military market segment in future. The consequences for the Bundeswehr are not clear yet, but it puts our industrial capability to service highly complex aerial weapons systems at risk. Ultimately this calls the deployment capability of the Bundeswehr into question". Internationally recognized development and systems capabilities, for example in the areas of aircraft construction or guided missiles, that had been developed in Germany over decades and which define Germany's role in NATO in important ways, Schoenemann continues, was being put at risk. Germany was not only threatened by the loss of technological competence and the drain of know-how, but would also face far-reaching consequences in terms of security and NATO policy. After the successful start of the Bundeswehr reform, the Federal Government, in particular the Ministry of Defence, would now have to meet its responsibilities also in terms of industrial policy. With reference to the examples in Great Britain and France, but also with a view to the Federal Government's successful space strategy, the BDLI now calls for the development of an independent military aerospace strategy for Germany. This strategy could define the situation in Europe and throughout the world, the areas requiring action in order to maintain Bundeswehr deployment capabilities and to meet NATO requirements, the technology areas, servicing concepts and areas of competence as well as the assignment of responsibilities and could determine Germany's role in Europe. "Germany will only be able to meet its security, NATO and economic responsibilities with a military aerospace industry that is efficient and viable in the long term", BDLI President Enders emphasized. The German Aerospace Industries Association (Bundesverband der Deutschen Luft- und Raumfahrtindustrie e.V. - BDLI) and its more than 200 members represent the interests of an industrial sector, which owing to international technology leadership and worldwide success has become a significant driver of economic growth in Germany. Combining almost all strategic key technologies, the German aerospace industry achieves a turnover of currently 25.7 billion Euros with a directly employed labour force of around 97,400. Communication with political institutions, authorities, associations and foreign representations in Germany is a major task of the BDLI. The association also offers its members a variety of services in Germany and abroad. 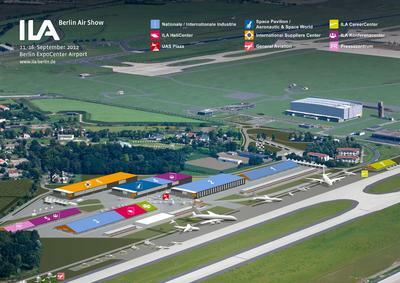 The BDLI is responsible for organizing the ILA Berlin Air Show International Aerospace Exhibition. The BDLI is officially accredited to the German Bundestag where it performs specific, legally embodied tasks. It is a member of the European umbrella organization ASD, Aerospace and Defence Industries Association of Europe, and the Federation of German Industries (Bundesverband der Deutschen Industrie - BDI).